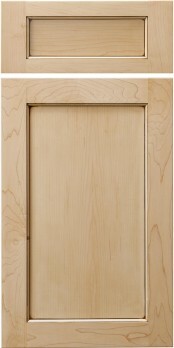 The TW-10 is a traditional flat panel door with a 1/4″ plywood veneered center panel. You can dress this door up by selecting an edge profile and framing bead, but please note there are no panel raise options available. This is the same door found in our Shaker series called the Stockbridge except that the difference between these 2 doors is that the Stockbridge design is only available with the Square framing bead. All, except G-121 panel groove.